This is the 4th and final post in the Great Eats in Los Angeles with the Family Series. Other posts in this series include 101 Noodle Express, Pizzeria Mozza, and Cafe Hiro. Some of my favorite “Japanese” style nigiri is not that Japanese at all. After all, traditional Japanese sushi is really quite simple. Master sushi chefs in Japan spend years perfecting fundamental techniques (e.g. making rice, slicing fish, etc. ), rather than designing new and innovative flavors. If you look at the menu served at the top sushi restaurants in Tokyo, you might be surprised to see that they all look the same. After all, it’s just the freshest fish of the day from Tsukiji Fish Market, optionally over vinegar rice, occasionally seared. That’s where other cultures can sometimes play a role. When Nobu Matsuhisa moved to Peru at the age of 24 to help open up a Japanese restaurant, he soon realized that many Japanese ingredients were not available down in South America. Nobu learned to improvise, making use of local Peruvian ingredients to create flavor combinations that are now imitated all throughout the world. It’s this type of “fusion” cuisine, Japanese raw fish combined with Peruvian flavors, that Nobu introduced to the US in the form of his first restaurant, Matsuhisa. Bryan and my brother-in-law Mike were immediately drawn to the uni shooters. Mike said it was one of the best one’s he’s ever had. In fact, they loved it so much we recreated them at home a few weeks later. Because I was in a group with all different sorts of people (aka, my family, who vary in their love of raw fish), we ordered a wide variety of dishes off the menu, using the a la carte menu to design our own “omakase”. 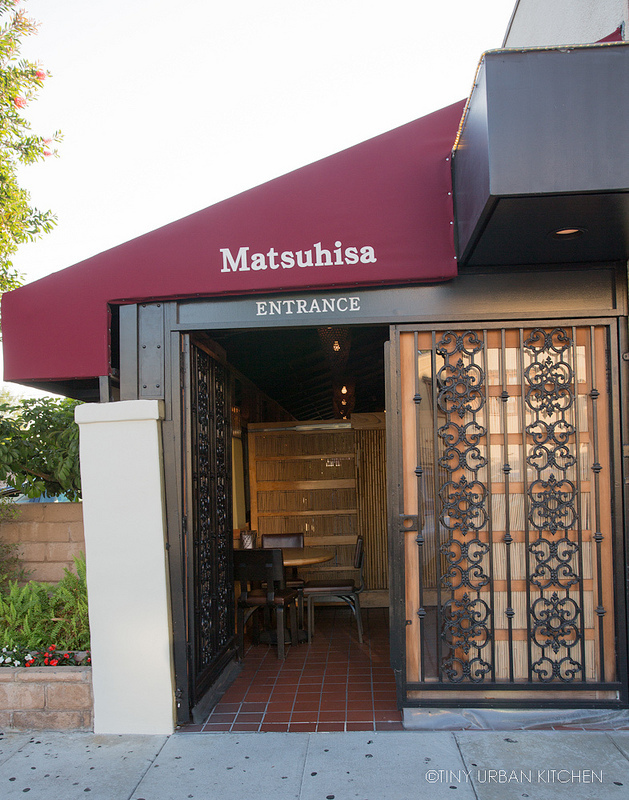 Many of the dishes at Matsuhisa incorporate South American flavors. You have the option of ordering traditional nigiri (and we did order a few of those); but why do that when the Peruvian influence is what makes his dishes unique? The hearts of palm salad was light and refreshing, spiked with a spicy jalapeno dressing. I was sadly a little disappointed with the toro tartare with caviar, though I’m not sure exactly why. I guess I’ve had some permutation of these ingredients so many times at various places (e.g., Morimoto, Oishii Boston) that it just doesn’t feel all that creative to me. There weren’t any special flavors in this dish – just a bit of soy sauce and wasabi. I almost felt like I could buy these same ingredients and just make this dish myself for half the price. If you really must, you can can order traditional nigiri right off the menu. My sister really enjoyed the egg custard (which looked excellent), and my brother-in-law thought the giant clam was great. We had a lot of fun with an appetizer called Crispy Rice wth Spicy Tuna. Square rice cubes are deep fried and served with mashed up tuna, scallions, and soy sauce. It’s fun to create your own little fun “bites.” The flavor wasn’t exactly groundbreaking, but the combination of textures (crunchy rice with the raw tuna) was interesting and fun. Matsuhisa supposedly invented the (now classic) combination of jalapeño and yellowtail with ponzu sauce. I’ve definitely seen versions of this combination in more modern sushi places (e.g., O Ya in Boston). It’s a killer combination, and this, along with the Peruvian tiradito (pictured waaay up top), were probably my two favorite dishes of the evening. The yellowtail quality was excellent, and the combination of the fish with the ponzu sauce and jalapeno was addictive. Certain members of our party were not huge raw fish eaters, so we ordered several cooked dishes as well. This squid “pasta” actually has no noodles. Instead, the squid is cut in a way that resembles pasta. The flavors of the dish were excellent – very flavorful, well-seasoned, and just all around tasty. This next dish, the Rock Shrimp Tempura, was my dad’s favorite dish. It’s a crowd-pleaser type of dish, something that’s easy for even the pickiest eater to enjoy. The rock shrimp w juicy and sweet, fried to perfection. The Chilean Sea Bass with Truffle was a bit disappointing. Again, I felt like they were trying to throw expensive ingredients on top of each other and hoping the final outcome would be tasty. It was OK, but, again, probably not worth the added cost. The King Crab Tempura, on the other hand, was definitely another crowd pleaser at our table. We all thought we were stuffed when Bryan noticed there was homemade soba with jalapeño sauce on the menu. Bryan loves noodles so much that he decided to order it. It was awesome. If you’ve never had homemade soba before, you really need to try it. The texture of homemade soba is so much superior to any dried soba I’ve ever tried. It’s much chewier and has a deeper, richer buckwheat flavor. When you finish dipping your soba in the sauce, they give you a pot of hot water to dilute your sauce so you can drink it as a broth. Finally, we tried a few desserts. The ice cream was fine but nothing special – simple Japanese red bean ice cream. Surprisingly, I actually loved the green tea mochi. I’m typically not a huge fan of the dense, ultra-sweet red bean filling that you often find inside green tea mochi. I was delighted to discover that this mochi was filled with a light green tea mousse that was not too sweet at all. I really, really liked it. Overall, I left surprisingly satisfied and happy. We sat outside in the annex area, which was a bit more quiet, spacious, and relaxed. Our family decided to design our own “omakase” instead of ordering the chef’s tasting, and I think it worked out great. The price was cheaper than if we’d gotten the omakase, and we had full control over which dishes we wanted to order. The food at Matsuhisa is still overall very solid. I would skip some of the gratuitous “luxury” dishes and instead focus on dishes that Chef Matsuhisa does best – fusion dish that incorporates Peruvian spices. My favorites were the tiradio and yellowtail with jalapeno, although I also really enjoyed the squid pasta, the tempura, and the soba. Been looking for a good review of this restaurant and this is it! Thanks!